RIO DE JANEIRO, Brazil, January 14, 2011 (ENS) – At least 527 people have lost their lives as mudslides brought down by weeks of rain struck three towns in the Serrana region of southeastern Brazil on Wednesday. The death toll is expected to rise when search and rescue teams reach remote villages cut off by the slides. Brazilian officials are calling the rains the biggest climate tragedy in the country’s history. Floods and mudslides have swept away entire neighborhoods in towns north of the city of Rio de Janeiro and the downpours continue. Rivers burst their banks and raged through residential areas built on steep hillsides, washing away hundreds of homes. Some 13,000 people have been left homeless. Power and telephone services along with bridges and roads have been severed by the slides, making it difficult for authorities to assess the full extent of the disaster. 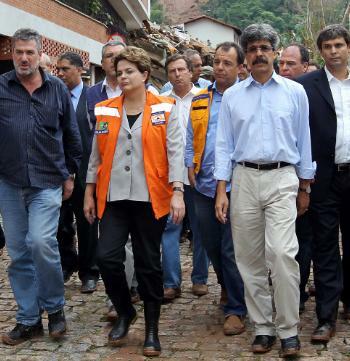 President Dilma Rousseff, accompanied by Defense Minister Nelson Jobim and Rio Governor Sergio Cabral, flew over the mountainous region on Thursday to view the damage. “It’s very overwhelming. The scenes are shocking,” she said. “We saw areas in which mountains untouched by men dissolved. But we also saw areas in which illegal occupation caused damage to the health and lives of people,” she said. President Rousseff said housing in high risk areas is the rule in Brazil, particularly where people cannot afford to build in safer areas. Rousseff, who was sworn in on January 1, has pledged “strong action” by her government to deal with the situation. On Wednesday, she signed a decree authorizing US$467 million in initial emergency aid for the mudslide-affected areas and sent seven tons of medical supplies. The health ministry says enough medication has been sent to treat 45,000 people for a month. 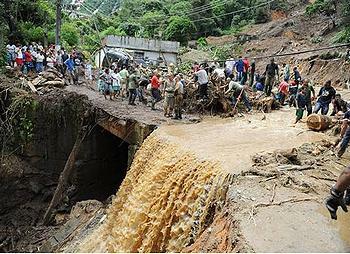 The hardest-hit towns are Novo Friburgo, Teresopolis, and Petropolis, local officials said. Some stricken villages have not yet been reached while more rain is expected in the coming days. More than 800 search and rescue workers and firefighters continue their search for survivors as renewed rains pour down. On Wednesday they achieved the live rescue of a six-month-old infant who they pulled from a flattened building in Novo Friburgo. The town of Teresopolis has set up two emergency shelters for the homeless and makeshift morgue facilities to receive the dead in police stations and churches. Meteorologists have blamed the unusual downpours on a cold front that has intensified the wet season that southeastern Brazil experiences every summer.